We started this week with a distinctive pirate feel. All around Fulham Palace children were climbing the riggings, sailing ships, walking the plank and of course chasing and catching baddie pirates! Some of the children challenged themselves to climb the ladder that had been hung from a tree at base camp. It was fascinating to watch them work out how to get up the ladder, with some managing to climb high enough to reach the tree branch with their hand. Other children challenged themselves to balance along a plank that was resting between two logs. With the help of a trusted educator at their side even the most cautious children succeeded in making it all the way from one end to the other. On Tuesday Marlon introduced the children to wood splitting and discussed how the children could make their own mallet. They were all very excited to have a go and it was impressive to see them remember the safety rules, attempt to put their own gloves on and sit with their hands behind their back ready for their turn. Marlon demonstrated how to use the bill hook and then children took turns to fashion their own mallet from a piece of wood, and sometimes an accompanying mobile from the sections they split. They were very proud of their achievements and rushed off to the forest to use their new mallets. Some children built a farm with a fence to stop the animals getting out. Some built houses and others carefully planned and created an intricate trap….to trap those baddie pirates of course! Later in the week the rain arrived, by the bucket load. Puddles galore were available for splashing in and it transformed the mud kitchen from dry, crumbling soil to wet sludgy mud, perfect for mud pies and chocolate cake. The puddles grew so big that two ducks even joined us on site to enjoy the weather. Whilst some children revelled in splashing in the puddles and squelching in the mud and searching for worms that were wriggling across the surface, others took to shelter for a while in our tipi and made an Easter card for their mums and dads. After lunch we had an Easter egg hunt... An educator hid the eggs and the children excitedly scoured the site from top to bottom to find them. When they were all found, the children counted them and asked an educator to hide them again, and so the Easter egg hunt continued! 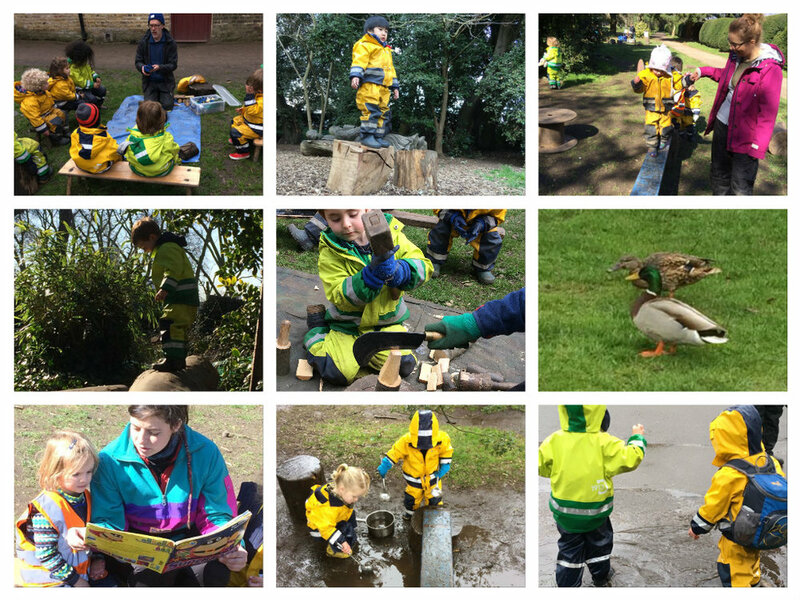 Whatever the weather this week, our Little Forest Folk have showed great enthusiasm, energy and imagination. Approaching each new challenge with excitement and determination, working together with their friends, helping each other and most importantly having bucket loads of fun!